Even though it’s the middle of January, my garden is humming with activity. As I write this, I can see dozens of birds of all types eating from my bird feeders, taking baths in their freshly filled birdbaths and gorging themselves on the various types of berries my garden provides. Clearly, my garden is a re-fueling station for many of these birds, and I’m happy to see them taking a break from their winter migration. 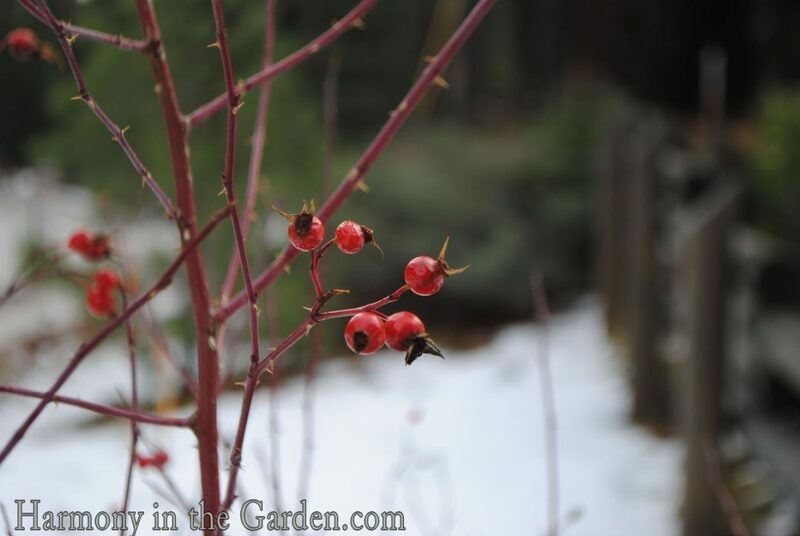 Trees and shrubs that offer winter berries are so important to include in your garden’s design. Not only for hungry birds, but because the berries themselves add much-needed seasonal color to winter’s more muted landscape. 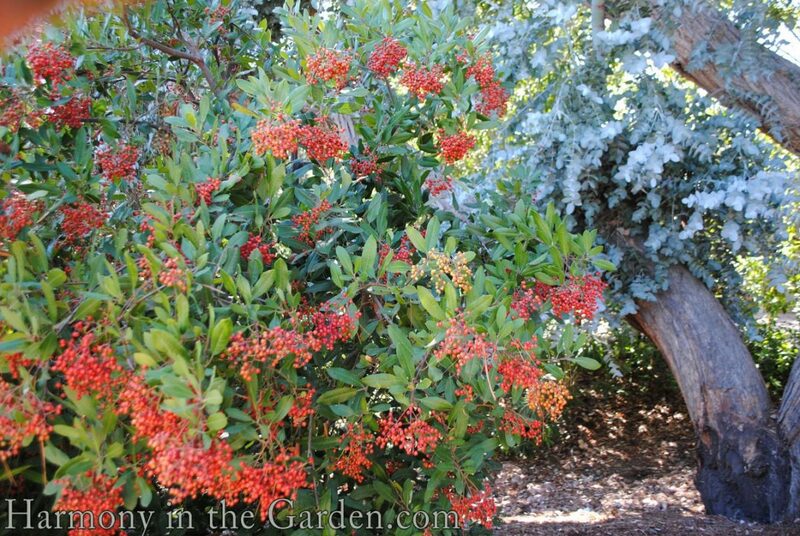 One of my favorite shrubs for winter berries is our native, evergreen Toyon (heteromeles arbutifolia). Just look how the berries pop against the green leaves and gray foliage of the eucalyptus. My mother’s ‘Adam’ Crabapple tree is, hands-down, the most stunning variety I’ve ever seen. 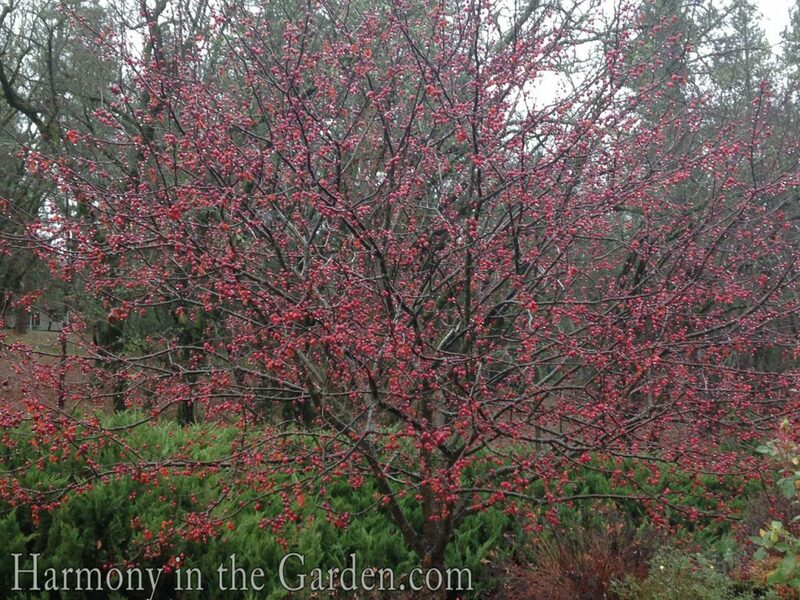 This mid-sized tree is literally covered in hundreds of cranberry-red fruits that hang on well into January. A ‘Snowdrift’ Crabapple tree grows in my own garden, providing fruits in subtle apricot and peach hues. I really like how the colors harmonize with the rusty iron decorations hanging on my fence. 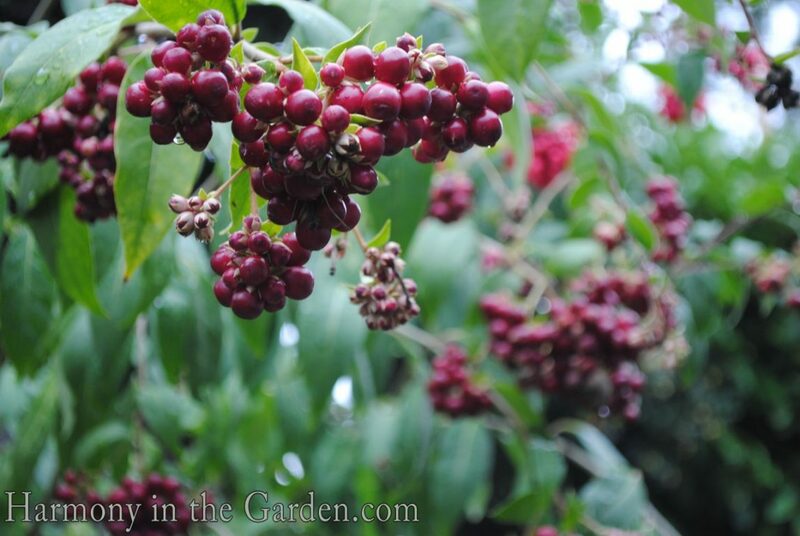 I couldn’t live without nandinas and have several varieties growing throughout my garden. 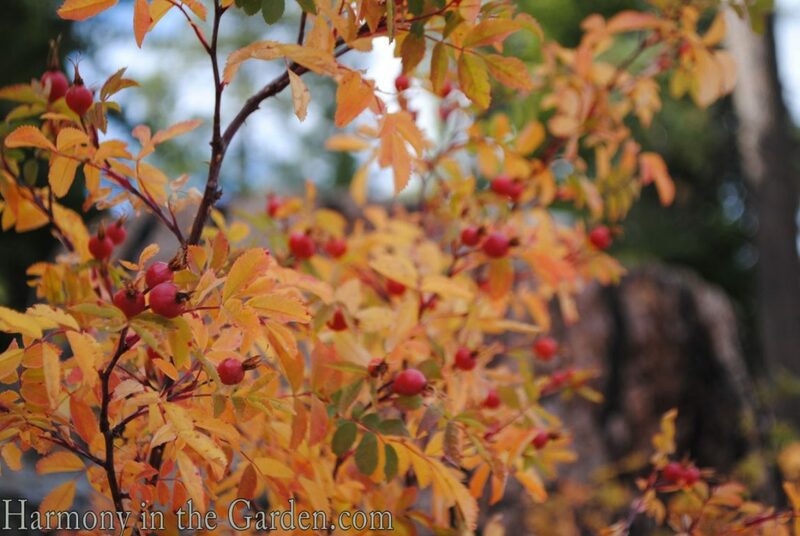 They’re not only evergreen, but many turn brilliant shades of red and orange once the temperatures dip. 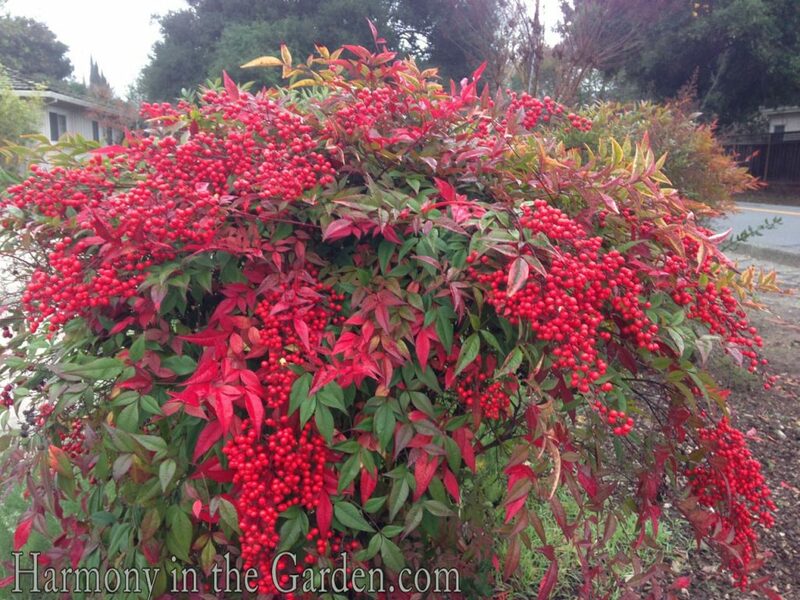 And the cheery red berries show up right in time for the holidays. 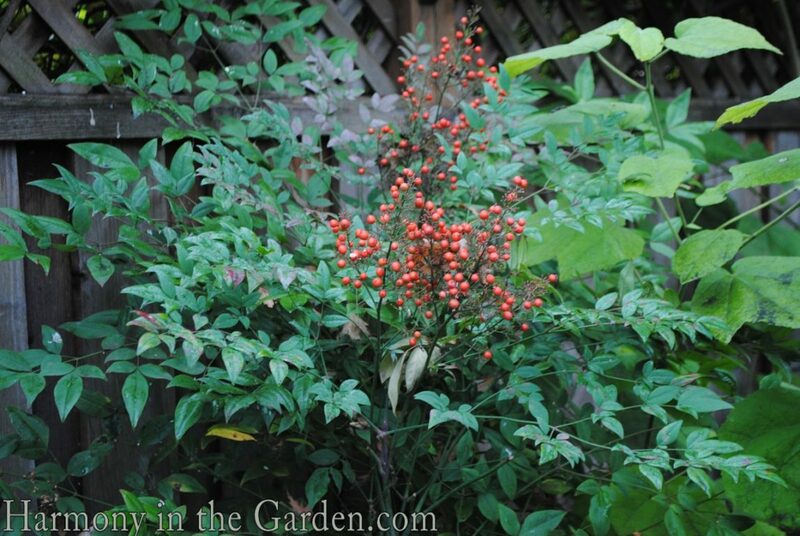 The nandina on the right grows in my neighbor’s garden and is the brightest red I’ve ever seen. And no, this isn’t photoshopped! Another favorite in my garden is my towering cestrum (C. newelii). In the spring and summer, it’s covered with small tubular flowers (shown on the left) which the hummingbirds adore. In the fall and winter, though, the branches are heavy with cranberry-sized berries just waiting for the hungry birds to arrive. The most active buffet in my garden, however, comes from my Pyracantha shrub. Every year it’s a hub of activity coming from robins, cedar waxwings and scrub jays to name just a few. Native currants and gooseberries not only provide stunning fall foliage, but their tiny berries seem to glow when set against a snowy setting. Many confuse currants with gooseberries, and while the foliage and flowers are similar, their berries are notably different. Click here for an interesting article on their differences as well as how to cook with them. 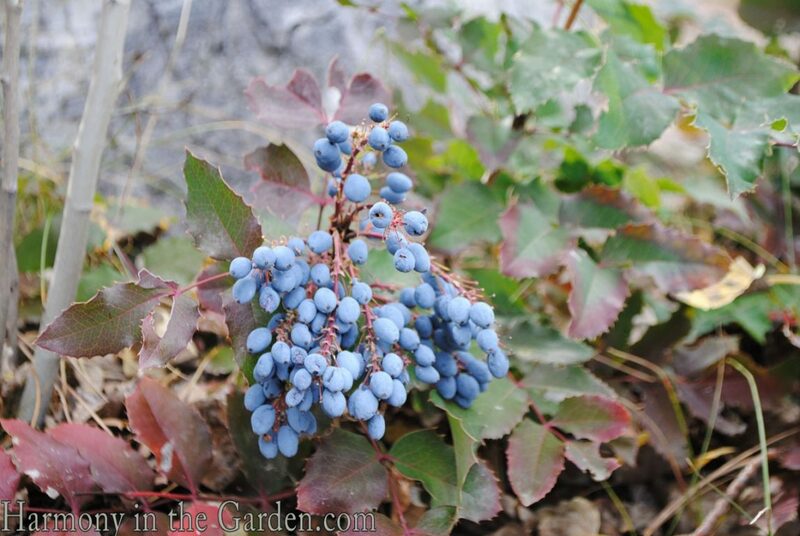 Mahonia repens, also known as Oregon grape, is another multi-seasonal native to include in the garden. In the spring, it’s dark evergreen leaves are punctuated by bright yellow flowers. But in the fall and winter, the foliage transforms into beautiful shades of maroon with grape-like clusters of cobalt blue berries. 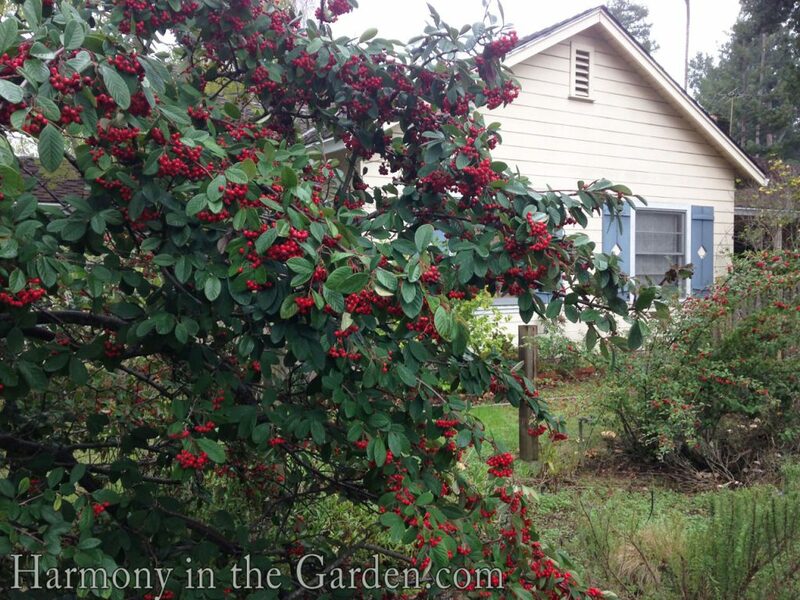 The cotoneaster family is an indispensable group of plants for winter berries. One of my favorites is the c. parneyi. 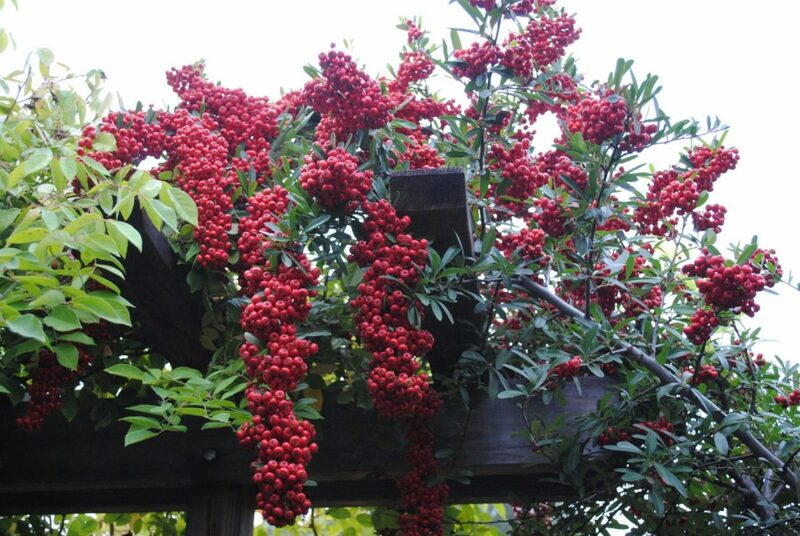 Quickly growing to 10’x10′, its graceful, arching branches are stunning when laden with winter’s deep red berries. 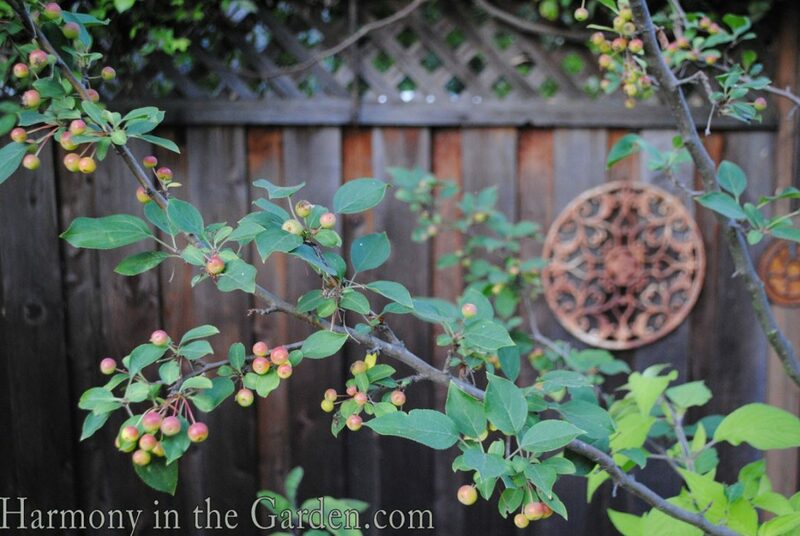 For a lower growing cotoneaster, consider the c. horizontalis. Growing to 2’x3′, I often plant this variety on hillsides or terraces as its thick, intertwining branches help control soil erosion. 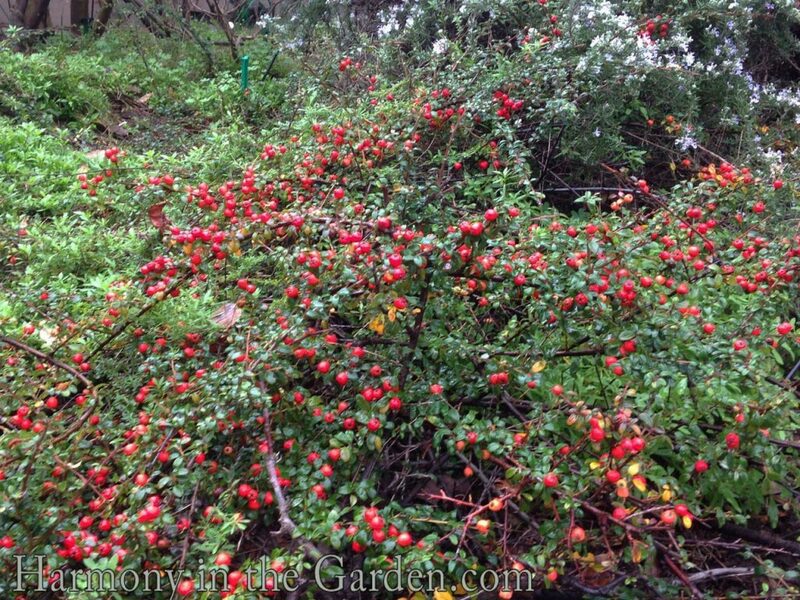 The Cranberry Cotoneaster (c. apiculatus) is a mid-shrub sized variety, growing to 3’x6′. 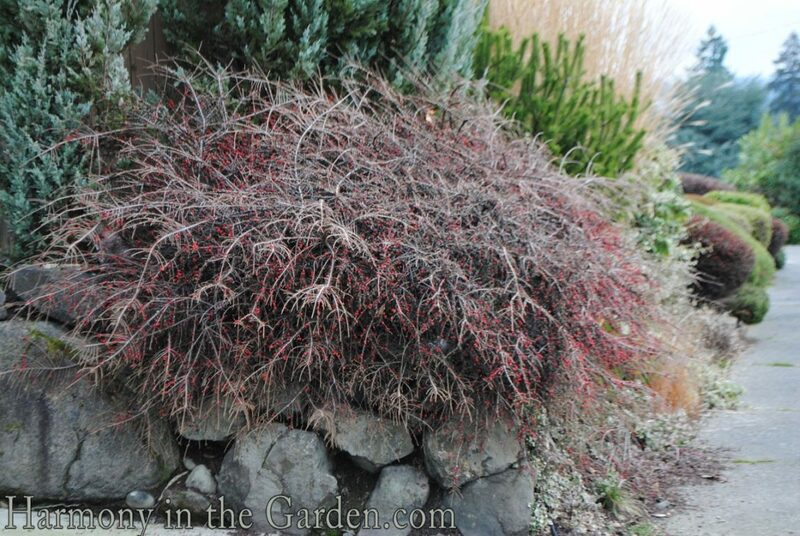 Its interesting herringbone-like branch structure is best appreciated in the winter, with it’s bright red berries drawing the eye to its unique form. 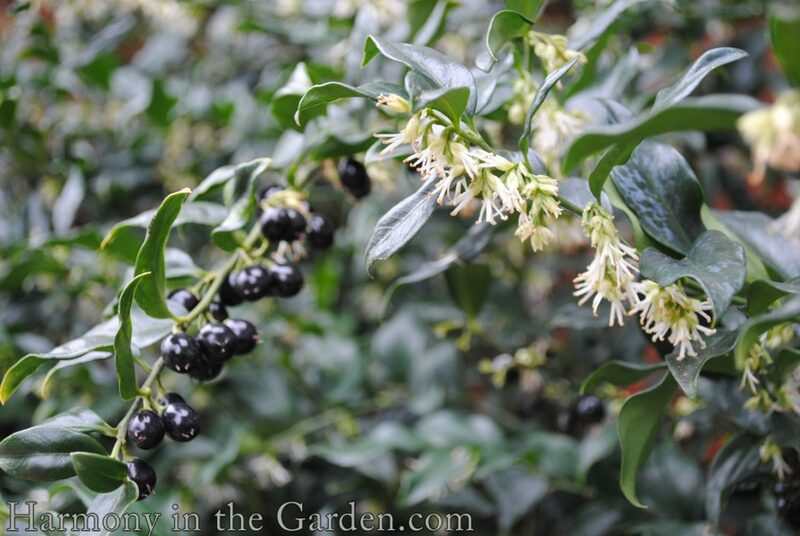 Sweet Box (sarcococca rustifolia) grows near my front door and will soon be perfuming my entire front garden. But in addition to its delightful winter fragrance, the shiny ink-black berries are a welcome change in color. I have a stand of black mondo grass planted near this shrub and I love the moody color echoes they create. I know I’ve only scratched the surface when it comes to winter berries. 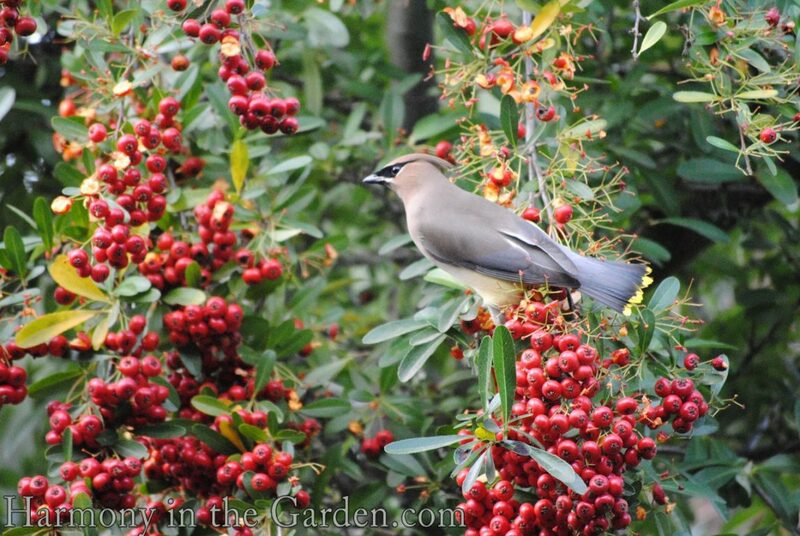 I’d love to know what berries bring the birds to your garden? ← New Year’s Resolutions & the final holiday giveaway! Your garden looks gorgeous – where do you live? I live in SoCal and grow all year (though I do know one can grow certain crops in the winter in colder locations). After visiting a nearby garden these past few days, plus seeing your post, I see something else I forget to put in my rushed designs’ arsenal…plants with winter berries! Even some cacti keep yellow fruit on them over winter. Hi David – so nice to hear from you! I’m working on a design this week and I’m having to remind myself to include winter berries. I think when we’re thinking so far ahead about what the garden will look like it can be an easy thing to forget. Cactus winter fruit – that’s something I know nothing about but I bet it’s beautiful! What a great selections. I only have few Nandinas and cestrum in my garden. I planted some toyon plants but so far haven’t flowered as they are small. Birds love the persimmons though and the olives make a tasty morsel too when ripe. Yesterday I saw a varied thrush couple in the garden, first time since buying the house 10 years ago. I wonder whether the nandina attracted them. You garden is so lovely and peaceful, very inspirational! Great post, Rebecca. I’m going to share it with a friend who just mentioned a desire to attract more birds to her garden. In my own, I have Heteromeles, Nandina and Asparagus fern. The berries on the Arbutus ‘Marina’ are edible but don’t seem to be a major draw (although the hummingbirds love the flowers). 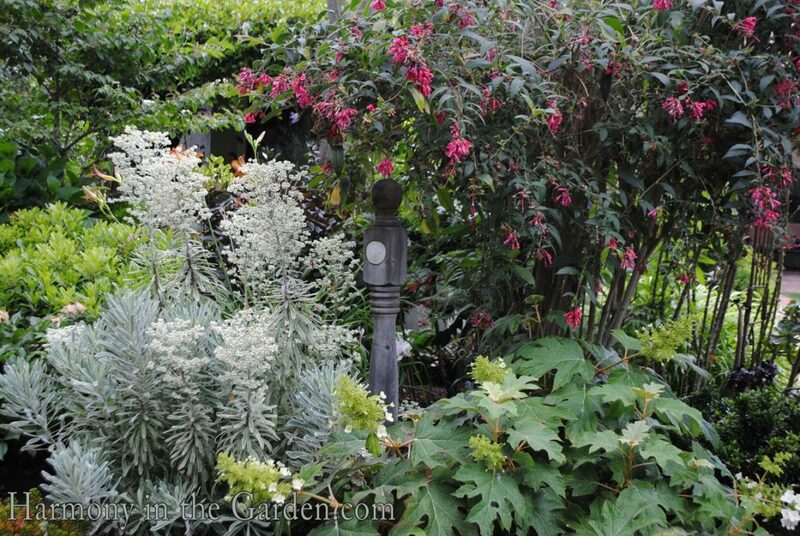 To bring in berries of a different color, I’m thinking of adding Mahonia. Hi Kris, and thanks for reminding me about the berries of the Asparagus fern! You’re right about the arbutus berries – they’re beautiful but they must not taste that great to the birds because mine end up falling to the ground, colorful but uneaten. Rebecca,loved and appreciated this article! I was just out for a walk yesterday afternoon and admiring an exquisite,berry loaded shrub (maybe a cottoneaster variety)in our neighborhood and was reminded that we need to get photos of a few of these cheerful berry branches for our website. Thank you also for helping me to identify some of the local varieties that we often see. Hard to choose which I like best and I now understand why there’s a hiking trail called The Toyon trail up at Hidden Villa! Glad you enjoyed the article, Nancy! I haven’t hiked the Toyon Trail at Hidden Villa but I think I need to add that to my list. I love that place! You’re welcome to use any photos of berries that I have for your site – just let me know and I’ll send you the pic. 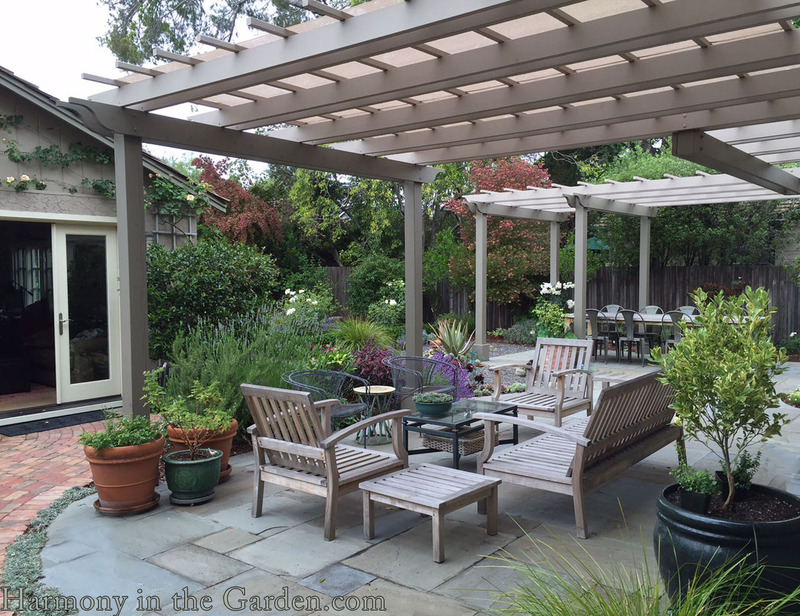 Truly harmony in the garden…enjoy every minute of your lovely garden! Thank you, Cristina. I’m glad you enjoy my garden, if not in person then at least virtually! What an inspiration as I seek to lure more birds into my yard so I can paint them! I currently have Chinese Beauty Berries which I adore (such a pretty intense violet) but the birds seem to ignore. How very lucky to have such a garden. I had 1/3 acre before we retired to a gated Community and I have a small patio. It is gated to keep the deer from feasting. I can grow succulents, and they give me some lovely colour, nothing like yours of course. I had all that,but took it for granted. Don’t ever do that. enjoy every leaf and blade of grass. I love where I am,with wild turkeys strutting their stuff,and deer sleeping in the bushes in my front yard. I miss my Los Altos garden. Keep those beautiful articles coming. Love and Hugs, Jean. Thanks, Jean. My parents are seriously thinking about moving into a retirement community and I just know my mother will miss her garden terribly. We’ve talked a lot about the positives that come with the change (as well as the negatives) so I can imagine what a hard decision it must’ve been for you. I’m glad to hear you’re enjoying the wildlife that visits and happy to hear that they can’t get to your precious succulents. Thanks for stopping by my blog this morning! Beautiful winter garden pictures. Very inspiring. I am going to plan a spot for Cotoneaster parneyi. I forgot how much I like that plant, even though I am not that crazy about other Cotoneasters. Thanks for a great post. Thank you, Carol. I’m glad you enjoyed my post and will be planting a C. parneyi. It’s such a fabulous shrub, isn’t it? I have two designs I’ll be working on this month and I think I’ll make a note to include one (or two) of them in their gardens. They make such a lovely screening plant, too. So that was YOU I heard romping through my garden this morning, Fran? 😉 I’m so glad you enjoyed my post. My Sarcococca is just about to bloom and I can’t wait to pick a bouquet to perfume my bedroom. Like you, I also love that discreet, lovely shrub. Have a beautiful week!